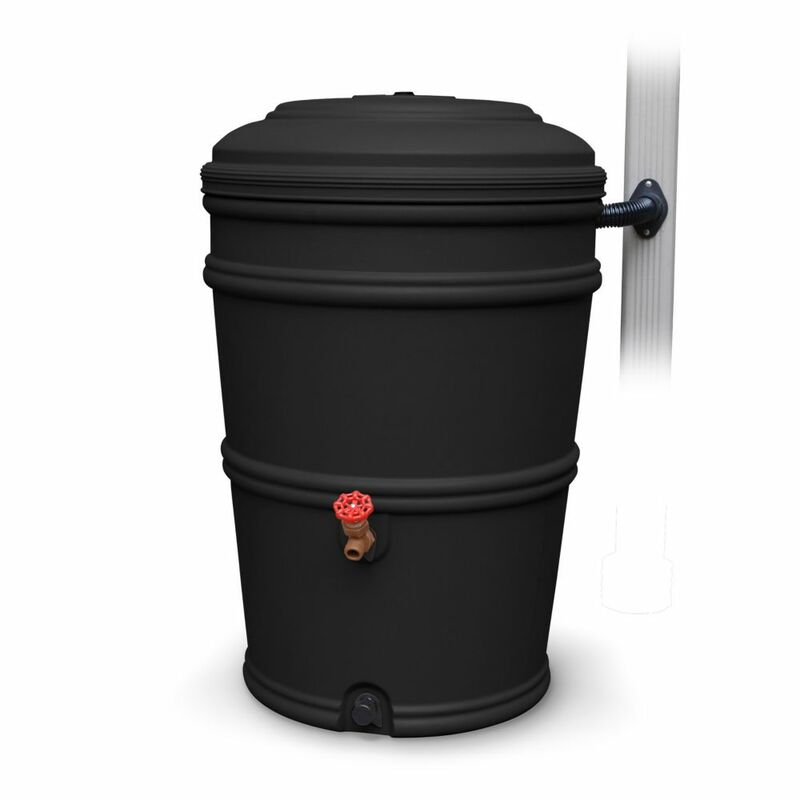 189L/50 US GAL multi-purpose rain barrel ideal for all outdoor chores in addition to saving water and reducing run-off. The Free Garden rain collection system is designed specifically with you the home owner in mind .Its sleek never aging look fits naturally into any location around the home .The flat back and square design allows it to fit flush to wall or corner installation .Injection moulded and made from high density polyethylene makes it easy to keep clean and looking brand new year after year .It comes complete with a powder coated steel screen ,all brass standard size spigot, extension hose and child lock screws .The spigot is located to allow for easy access with any watering can eliminating any need for a base .The two sided overflow allows for multiple connecting containers from either side . Your garden and lawn will love your preserved precious warm natural rain water. Embrace nature's solution to our emerging water shortage-collect rainwater! Our authentic oak barrel texture is moulded into each barrel and will not fade, rot or risk insect infestation. 189l (50 Gal) Rainstation Charcoal 189L/50 US GAL multi-purpose rain barrel ideal for all outdoor chores in addition to saving water and reducing run-off. 189l (50 Gal) Rainstation Charcoal is rated 4.3 out of 5 by 25. Rated 5 out of 5 by EV from I bought two of these rain barrels with a connector... I bought two of these rain barrels with a connector kit. I read the directions carefully and repeatedly before drilling and connecting everything. Make sure to read and try helpful “Tips” Two good rainstorms filled two 50 galon barrels quickly. Might get a third! Rated 5 out of 5 by KLJ from Unfortunately, after purchasing this barrel, we have received about 24”... Unfortunately, after purchasing this barrel, we have received about 24” of rain. I’ve had to empty it more times than I’ve used the water collected. But that just means it’s doing it’s job. I do wish it had come with a metal spicket. I will be Buy my more! Rated 2 out of 5 by Cyclingbob from I'm surprised so many people like this unit. I rated low because of plastic spigot and rubber thr... I'm surprised so many people like this unit. I rated low because of plastic spigot and rubber threads! It leaked the 1st time and could not tighten to stop leaks. I replaced rubber threads with PVC connector and 'O' ring. I'll make my owe rain barrow the next time and I need 3 more. Rated 5 out of 5 by Dianne from Easy to install, looks nice in the front garden, and... Easy to install, looks nice in the front garden, and works beautifully. Hubby was so impressed that I did it myself! Five stars! Rated 5 out of 5 by Looneyburger from The instructions were well written and easy to follow. ... The instructions were well written and easy to follow. Set-up was easy. We've had plenty of rain, the barrel is full, and my wife is using the water for her indoor plants. Rated 4 out of 5 by Scott from the unit is good, the spicket is inferior! how the... the unit is good, the spicket is inferior! how the spicket sets in the barrel needs to be reinforced. Rated 5 out of 5 by Keupher from Easy to put together This barrel was incredibly easy to put together and install. Good instructions, all the parts are easy to locate, and easy to assemble. We love the look of the planter in top of the rain barrel as well. Great addition to our home.